Poison dart frogs, also called poison arrow frogs, get their name from their toxic skin secretions. Tribes in the frogs' native habitats used the frog poison on their arrows. The frogs' vivid colors warn potential predators they aren't safe to eat. 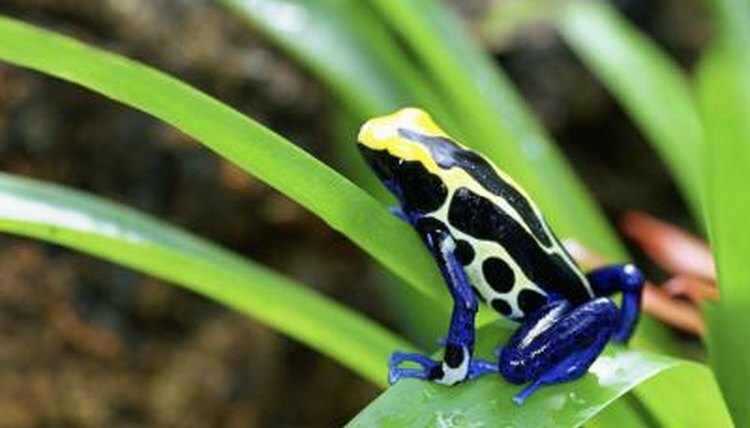 As adults, poison dart frogs are carnivores, yet many are omnivores as tadpoles, says National Aquarium Curator Ken Howell on the organization's website. Native to Central and South American rainforests and to some Hawaiian islands, poison dart frogs hunt spiders and small insects such as termites and ants. With a fast tongue flick, the frog grips the prey and pulls it into his mouth. Keen eyesight gives the tiny frogs an advantage for finding prey. Their zoo diet consists of crickets, the Smithsonian National Zoological Park website reports. Many poison dart frogs eat algae as tadpoles. Because algae is a plant food, their diet is omnivorous at this stage. The tadpoles grow into baby frogs in small pools of water where they eat tiny insects as well as the algae in the water. Poison dart tadpoles will also eat other tadpoles, according to the National Aquarium website. In the dyeing poison frog species (Dendrobates tinctorius), the female returns to each tadpole to lay an unfertilized egg for her offspring to eat.